Stefano has received considerable attention and coverage on this blog, rightfully so. He has been central to my diving education – helping me get through the AIDA 2 freediving requirements and a good diving buddy, to say the least. Merman/Aquaman… Stefano takes all titles in the ocean when it comes to freediving in Brunei. It is such a privilege to be around him as he is very skilled in the water and speaks so passionately about freediving and other interesting topics like food, travel and socio-political issues. Years Freediving: 3 years, though started spearfishing at the young age of 15 for a few years before travelling all over as a barman and getting formally certified as a freediving Instructor. 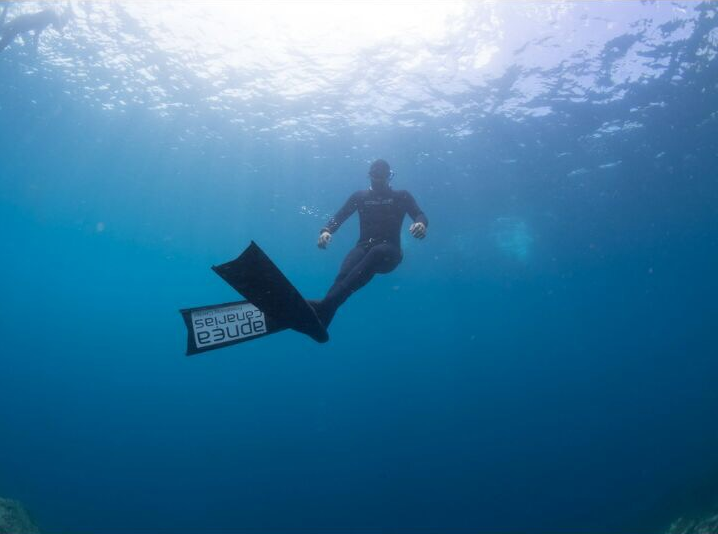 You’ve been around (the world) quite a bit and only started freediving recently. What got you into the sport? I think the lines are blurred when it comes to defining me as a freediver. I have always been a natural in the water as I used to spearfish by the time I was a teenager and did some competition swimming. I traveled around tending bars, which got mundane, so when the opportunity to learn freediving came up, I thought “heck, it’s about time.” At whatever freediving level I pursued, I was able to meet the requirements in no time. For example, the AIDA Instructor Certification requires about 3 months in learning. I was able to do it in 2 months as I got to pick up diving and teaching skills by observing and teaching alongside my mentors and other freedivers day in and day out. What got you to Brunei? I met the Poni Divers owner, Thye Sing, when he came to train in freediving with us in Tenerife, Spain. He later invited me to come to Brunei and train the Poni crew in freediving as well as help the freediving scene in Brunei grow. What do you think about freediving in Brunei? Brunei freedivers may have a tough time as the sea conditions are not always ideal – there has been a lot of current and low visibility. The past couple of weeks have been nice though. We were able to get as much as 20-25 meters of visibility from the surface and view a bit of the wreck sites from a distance. Where have been the best freediving sites (around the world) that you’ve been to? The best place I have been for freediving is Tenerife (Canary Islands, Spain) where the sea conditions are almost always beautiful. There is hardly any current and usually more than 30 meters of visibility. It’s quite easy to go to depths without having to take the boat. You can also get to 100 meters in deep diving just by swimming 50 meters out from the beach! What would you say to someone who doesn’t know about freediving? If you want to know your body better and parts of it that you never thought you could use, just freedive. If you especially want to learn to control your mind, learn to freedive! 70% of the world is made of water so think about it, the real world is down there in the marine world. Stefano is with Poni Divers in Serasa until end of September. The center is now offering freediving courses under the guidance of Stefano and their certified freedivers. Follow Poni Divers on their website, Facebook (/PoniDivers) or Instagram (@ponidivers) for a variety of diving courses, fun dives and their weekly boat schedules.